The Japanese Crepe borrows from a western concept and modernized it into new level of versatility that you can gobble on the go. Building on this new concept, T-swirl started to research and have perfected the 100% gluten free rice flour batter, to craft a crispy thin chewy layer that embraces all the decadent condiments. 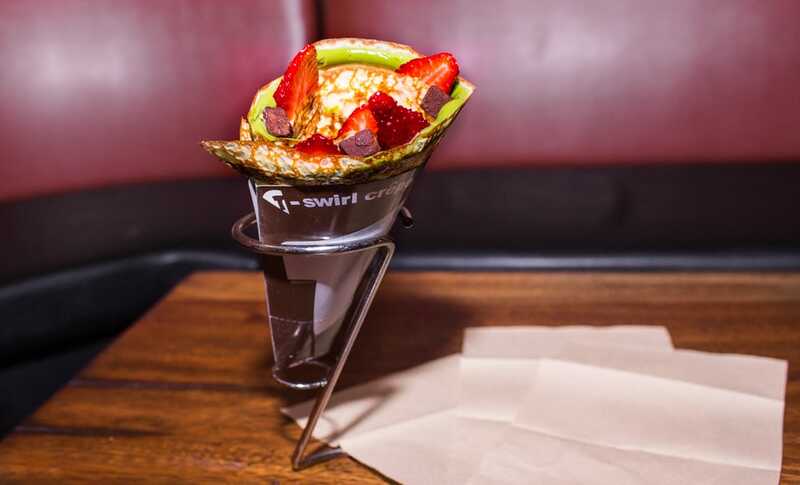 T-swirl is synonymous with using the finest ingredients to construct a trendy/artistic crepe that arrives to your hand with incredible speed. We have standardized the process to give you a consistently clean and delicious crepe. Their experts skillfully pour the exact amount of batter, and the placement of each ingredient to produce the perfect crepe. Each bite, no matter sweet or savory, is identical and bursting with fresh exquisite flavor.